The Pro XL Series 32x32 YUV Matrix Switcher from Sierra Video is a high-bandwidth routing switcher for RGB/YUV, S-Video (Y/C), and composite video signals, and for analog audio signals. This is a 32-input, 32-output unit with a 3-channel design that operates at 450 MHz. It supports Matrix Mapping Universal Breakaway Switching that provides independent switching of every level of every R, G, B, left, and right audio input on the routing switcher. You can switch a single level or any combination of levels. For example, you can input a composite video signal on the R level of input one and an S-Video (Y/C) signal on the G and B levels of input one, then switch only the composite video signal on the R level, only the S-Video Y and C signals on the G and B levels, or switch all three levels together. 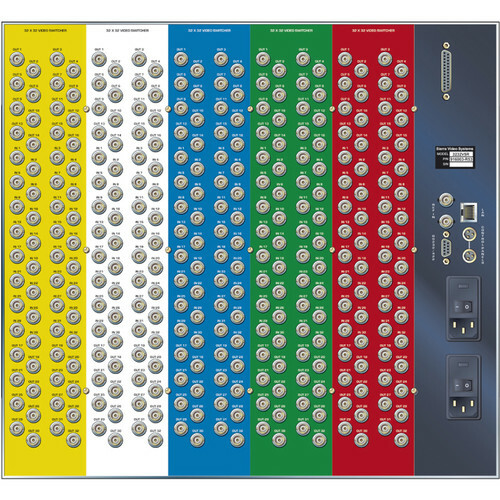 With Room Grouping capability, several inputs may be grouped and operated independently of other input groups on the routing switchers. This allows one routing switcher to be used for multiple rooms where the control system for each room will address only the inputs and outputs assigned to that room. Qwik Adjust Knob Rotary Control interface consists of a user-intuitive knob along with the 80-character LCD display. This provides quick and convenient setup, adjustment, and signal switching. The switcher comes in a 3RU frame and can route any or all inputs to any or all outputs. High bandwidth (450 MHz) and low crosstalk.